*I Will Love You Forever *reveals one woman's decades-long quest to find healing and redemption after the accidental death of her sister as a child. God has used hospice babies—those left to live and die without family to care for them—to mend Cori's broken heart. Bringing these fragile hospice babies into their home, Cori and her family have promised to hold them briefly, until their last breath on this side of heaven, but to love them forever and always. The loving actions of Cori and her family show that we can do all things through Christ who gives us strength. A very eye-opening, very emotional true story. 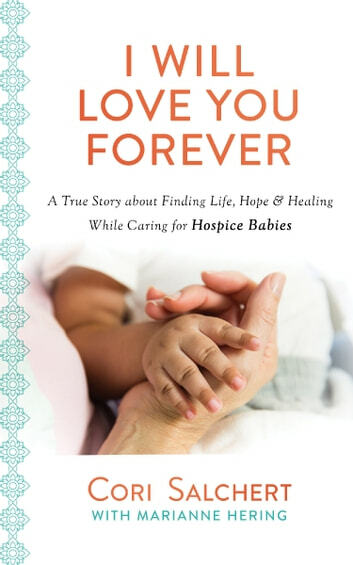 The author, Cori Salchert, tells of her many struggles, fears and unanswered prayers that led her to be who she is and give her the strength to care for Hospice babies. Many debilitating health issues, loss of a meaningful job, struggles at home all took her to the unthinkable attempt on her life. God brought her through all this so that she could see the bigger picture and what her purpose was in this life. Being a nurse, she felt led to foster medically needy babies and give them comfort and love for the short time they had on this earth. Soon she had her husband and her eight biological children on board to help. Follow her story from things that happened in her childhood to the years of searching for a medical diagnosis for her abdominal pain that had her bedridden. As she struggled with her faith, God brought her closer to him and showed her what he wanted her to do. I totally admired her courage and her strength. God gives each of us gifts uniquely ours to bring about his purposes on earth. Cori Salchert was open and willing to hear his plans for her. Everyone needs to read this moving story and see what is truly possible when we open our hearts. I received a complimentary copy of this book from Barbour Publishing and was under no obligation to post a review.